Patients using these medicines are advised to quickly contact their hospital or clinic to get replacements. FDA secretary general Dr Tares Krassanairawiwong said on Friday that a precursor chemical in many lots of these medicines proved carcinogenic in guinea pigs. “This chemical is manufactured in India,” he said. Tares said only medicine from Berlin Pharmaceutical Industry Company is affected by the recall. 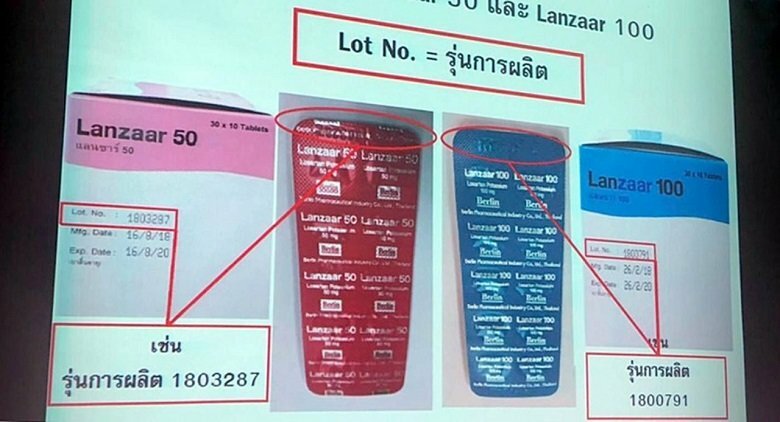 The firm is the only drug manufacturer in Thailand to have imported the problematic chemical from India and used it in manufacturing 142 batches of Lanzaar 50 and Lanzaar 100. The batches being recalled are Lanzaar 50 in 1800670-1800697, 1800839-1800850, 1800927-1800942, 1801034-1801041, 1801135-1801143, 1803285-1803291, and 1803841. Lanzaar 100 batches being recalled include: 1800698- 800707, 1800788-1800797, 1800943-1800958, 1800994-1801009, 1801236, and 1803622-1803629. Patients are strongly warned against discontinuing these medicines on their own. “If it is still inconvenient for you to get replacements, keep using these medicines until you can get new medicines,” Tares said. FDA deputy secretary general Dr Surachoke Tangwiwat said if patients suddenly stopped using the medicine for hypertension, they might suffer heart failure, become paralysed, and even die. The FDA plans to investigate more hypertension medicines to determine if they have cancer risks. Last year, the FDA also recalled several hypertension medicines that contained valsartan. The Thai FDA appears to have been a bit slow off the mark in issuing the recall. I have just returned from my local Government hospital which prescribes me LANZAAR 50 for hypertension. The pharmacist checked the batch number and has assured me that my prescription is NOT one of the recalled batches. Read the link which lists the batch numbers in question but if in doubt, and you are prescribed the drug, check with your local pharmacy - mine was extremely helpful.